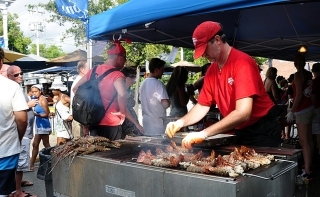 Adams Morgan Day: It's Back On for 2015! Adams Morgan Day returns this Sunday from noon to 6 p.m.
Adams Morgan Day almost didn't happen this year, but local businesses and residents rallied to bring back the long-running neighborhood festival -- it'll just have a slightly different feel. Earlier this year, the event's sponsor, Adams Morgan Main Street, announced that the fest was cancelled, WAMU 88.5 first reported. The cancellation was prompted by what has been deemed a financial crisis among the area's leaders, leaving planners with tens of thousands of dollars in debt. After board members' attempts to salvage the historic festival, residents and local business took charge and planned an alternative "festival powered by volunteers," according to a press release. The 2015 Adams Morgan Day celebration is returning this Sunday from noon to 6 p.m., along 18th Street and Columbia Road in Adams Morgan, but unlike past years, 18th Street will remain open to traffic. Eleven shops and restaurants along 18th Street are on board to host a smaller version of the festival, which has filled streets with thousands of people in the the past, The Washington Post reported. Many of the visual artists who used to be found at Arts on Belmont will display their work inside restaurants and businesses along 18th Street and Columbia Road instead. Local bands will grace impromptu stages at the Brass Knob, Libertine, Roofers Union and the Black Squirrel, among other locations. Area restaurants will provide food instead of outside vendors serving up street food; however, a few outdoor events will remain the same. The SunTrust Plaza will feature band performances, and the Dance Pavilion and Children's Center will be located at the Reed Community Center playground and tennis courts. Tie-dye shirts, belly dancing and pet adoptions are among more than a dozen events listed on the website.